A roof coating can save you a huge amount of time and money on your roof. This cost-effective service will restore the condition of your roof. Empire Contractors provides the people of Grand Haven, MI with flawlessly-applied roof coatings. For a free estimate on a new roof coating, give us a ring at (231) 578-4760. At Empire Contractors, we stick to the most trusted manufacturers in the business for our roof coating products. This includes Mule-Hide, Conklin, and Firestone. Our roofers are extremely experienced when it comes to roof restoration. We’ll make sure to apply a roof coating so that it adds a completely seamless protective layer to your roof. The longer you wait to restore your roof, the worse the condition of your roof’s membrane can become. This time may be the difference between a roof that can last another 10+ years or a roof that needs to be replaced. Don’t put it off any longer. Give us a call to get your roof back on track. The team at Empire Contractors has been helping people get longer lasting roofs for more than two decades now. Most contractors in the area can’t match that level of experience. We’ll be able to cure any of your roof’s problems in a timely and affordable manner. 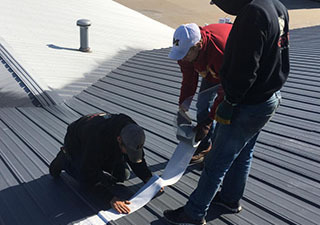 Our crews know how to repair and restore all commercial roofing systems, including metal, TPO, PVC, EPDM and more. Aside from extending the life of your roof and preventing leaks from occurring, there are other reasons to get a roof coating. For one, a roof coating will make the most out of the roof you already paid to have installed. This means less waste. Plus, roof coatings are reflective. This will really improve the energy-efficiency of your building which means big savings in the long run. If you think a roof coating might be right for your roof, call Empire Contractors today at (231) 578-4760. We’re the go-to roofing company for clients in Grand Haven, MI. We’ll come by to check on your roof and let you know what your best options are. You can always count on us for honest professional advice!